I found this empty beetle casing (where did it go..??? ), on my walk along the beach. It was quite strange eyeballing it closely to paint! 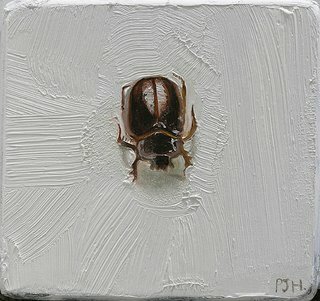 The last time I attempted to paint bugs would have been about 25 years ago when I did a large painting of house flies. In those days I painted small things on a larger-than-life scale. Now I paint more on a one-to-one scale, but the paintings are "bigger". 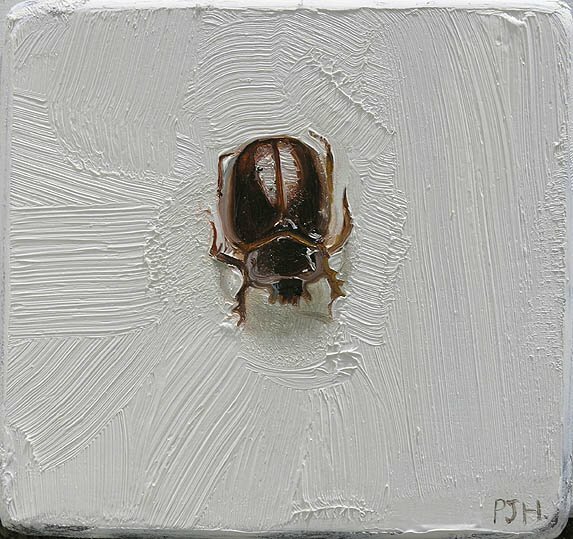 When I photographed this painting it occurred to me that it seemed like the bug was trapped in the wet paint. Wow, awesome, scary, very real! I like that one a lot! How big is it? Thanks all! Sorry I forgot to put dimensions for this one. It's 75x80mm. Quite small - I wanted to paint the bug life size. Quite a challenge in sticky oil paint!